I am on the plane, taxiing to take off from JFK to LAX, on the way home. I set an alarm for 08:30 this morning, and woke up a bit before it went off. After the usual breakfast of cereal in the hotel dining room, I spent some time packing until about 09:45, when I headed out to the Discovery Exhibition Centre near Times Square, where they hold various rotating exhibitions. At the moment they have Body Worlds, and a Vikings exhibit, plus the one I wanted to see: Star Wars and the Power of Costume. 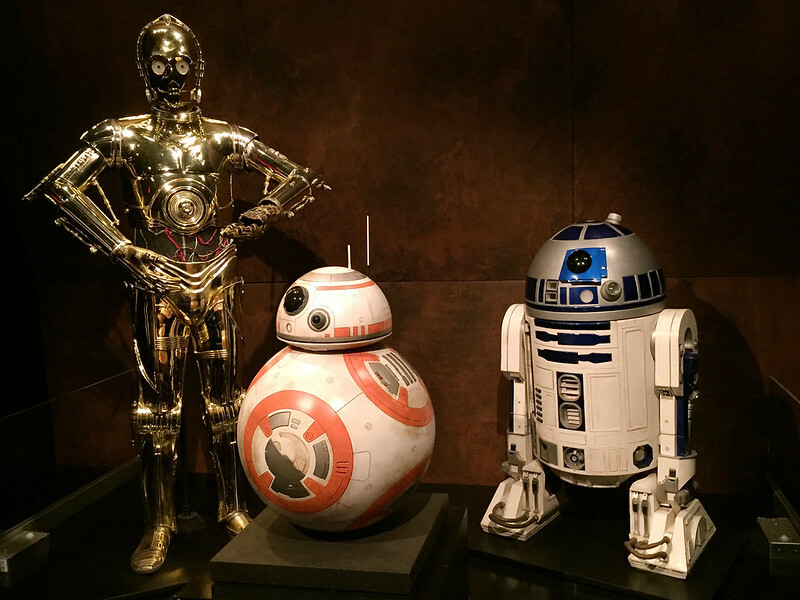 Droids, at Star Wars and the Power of Costume. On the way there, I noticed market stalls being set up on Sixth Avenue, with the avenue blocked to traffic for at least a couple of blocks, although the intervening cross streets still carried traffic. It must be a Saturday morning thing, because there was no trace of a market when we arrived last Saturday evening. The Star Wars exhibit opened at 10:00, and when I arrived there was an older couple already waiting. As we waited, more people arrived, including one guy in his 20s, wearing a Star Wars shirt, Star Wars jacket, and even Star Wars pants with a Rebellion logo on them. There were about 20 people waiting when the doors opened. Most seemed to have pre-bought tickets, as they went straight to the exhibit entries, without stopping to buy tickets like me. 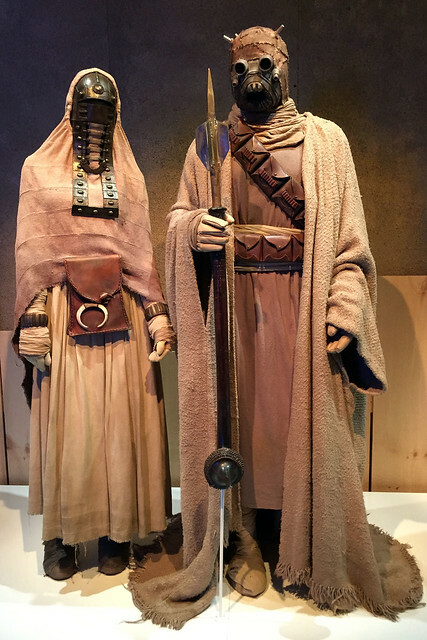 Sand people, at Star Wars and the Power of Costume. They only let about 20 people into the exhibit at a time, and funnel you through a short video presentation first. I was hoping it wouldn’t be too long as I only had a limited amount of time. But I was in the first group and got into the exhibit while it was basically empty, so had a good chance to see all of the costumes and other props up close, without crowds. It was mostly costumes displayed on somewhat disturbing faceless mannequins, but there were a few props like lightsabres, blasters, and gadgets like comlinks. A good chunk of the costumes were Padmé’s various outfits from the prequels, as well as various senator robes, but many of the classic original trilogy costumes were there too. Pretty much all the usual suspects were included, which was nice. 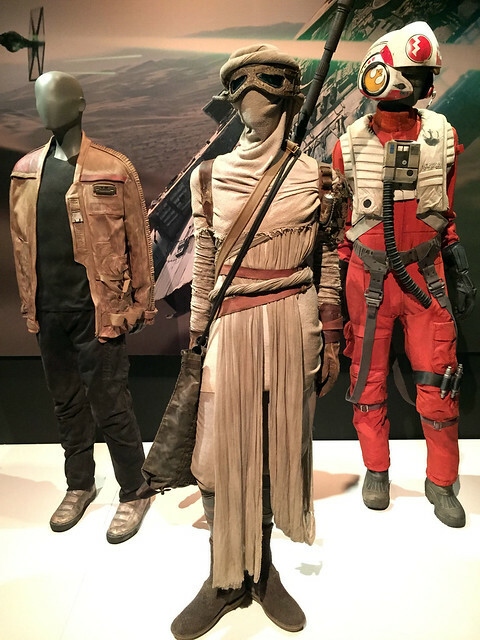 Most were from the first six films, but the final room had three costumes from The Force Awakens, including Rey’s desert costume. Rey, Finn, and Poe, at Star Wars and the Power of Costume. I left just before 11:00 and headed back to the hotel to shower, change, and finish packing my bag for the flight home. After checking out, I walked over to Cafe BXL on 43rd Street to meet Gary for lunch. By this time the market was in full swing, with stalls on both sides of Sixth Avenue selling food, clothing, artwork, bags, jewellery, and so on. I walked down the three blocks to 43rd through the market, taking in the bustle. I arrived at the cafe a bit early and so sat at a table facing the street up the front. While I was waiting, a waiter came over and mysteriously put a cup, teabag, and put of hot water on my table, then left before I could say anything. Then a bit later a guy returned to his friends at a table nearby and signalled the waiter, asking where his tea was! 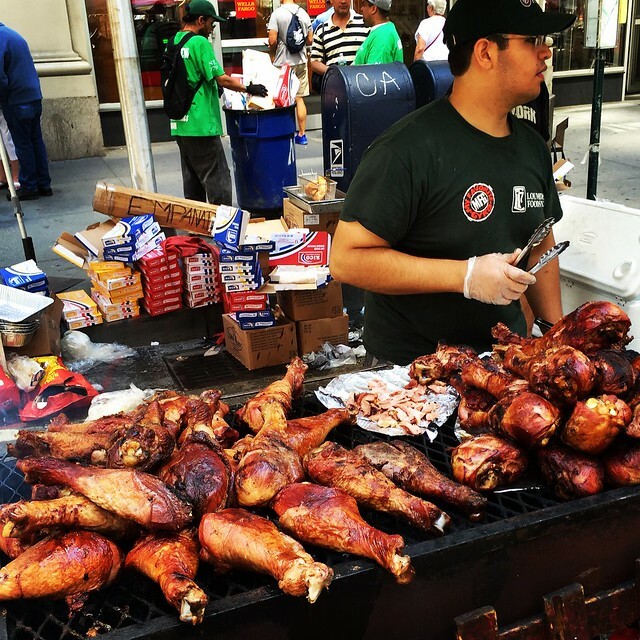 Barbecued turkey legs, Sixth Avenue market. I ordered a Cuvee BXL beer, which was their own house brew. It was pretty good, fruity and a little bit spicy. Gary arrived on time and we ordered some food. 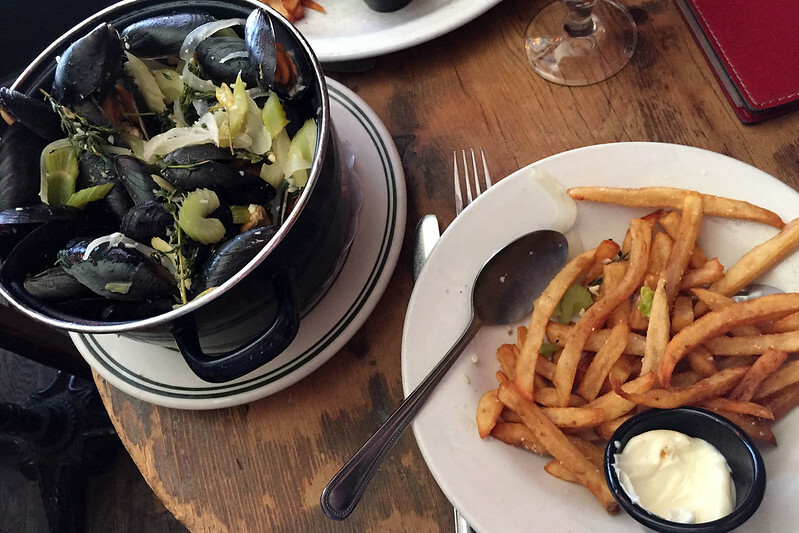 He got a burger, while I had to try the specialty of moules-frites marinière. This was a huge steel pot of mussels cooked in a buttery white wine sauce with loads of onions and celery, plus a serve of hot chips on the side, with thick mayonnaise to dip them in. Gary advised me to discard any mussels that hadn’t opened during the cooking, and indeed there were a couple in there, which I duly left aside. The rest of them were tender and delicious. It took some fiddling to extract them all from the shells, and Gary finished eating well before me. The waiter also brought some bread, which we ignored as we ate, but I grabbed a slice after finishing the mussels and dipped it into the remaining soup of onions and celery to soak up some of the juices. It was delicious but extremely buttery, which I hadn’t noticed so much eating the mussels, as they didn’t soak up the liquid as much as the bread did. Over the meal we chatted about all sorts of random stuff. I expected there might be a bit about comics, but it barely came up as a topic. Instead we talked about travelling, New York, Australia, and stuff like that. It was a very pleasant and enjoyable lunch, and a good way to finish up the trip. At 14:00, we left the cafe and walked over to the 42nd Street subway station for me to catch the A train to the airport. Gary left me there, presumably to go to Penn Station for his own train back to New Jersey. I caught a train quickly and had a leisurely ride out to Howard Beach, where I got off and topped up my Metrocard with $5 for the fare on the airtrain to JFK. I managed to use almost all my cash after paying for half the lunch, and ended up with just US$2 left. A train left pretty soon afterwards and I was at the terminal to check in pretty quickly, as there were no queues at the desk. I asked the woman at the check-in counter if I needed to go through immigration in New York or at Los Angeles. She said that it wasn’t needed for leaving the United States. “They care about people entering the country, but they don’t care about people leaving.” There was however a long queue at security, and it took some time to get through there. Once through, I found the Trafalgar Pub, a faux-British pub which M. had mentioned in a message when she was at the airport yesterday. I sat and enjoyed a Stella Artois while typing up yesterday’s events and waiting for the flight to board. And now we’re on our way to LA. I’m on the second leg of this flight, from LAX to Sydney. The flight from New York landed on time just a few minutes after 9pm Los Angeles time. I had an hour and a half before the Sydney flight departed, which meant just 30 minutes or so before boarding began. The transfer was trivially easy, being a short walk to the adjacent gate at LAX to pick up an A380. I’m sitting next to a voluble man who has been chatting with me about his business refitting classic cars with modernised equipment, and his travels around the world. He’s a keen photographer too and we’ve been sharing travel photos with each other from our iPads, sometimes even comparing our shots of the same places, such as Machu Picchu. The dinner service is just starting, after which I will try to sleep for as much of the remainder of the flight as I can. After eating the late supper on the plane, I used an eyemask and earplugs to try to block out the surroundings and get some rest. I think I managed to snooze for a while, and the time passed reasonably quickly. I began waking up for the breakfast, a couple of hours before landing, which happened around 06:30 on Monday morning. I was out of the airport quickly, thanks to having only carry-on baggage, and into a taxi after only a short wait in the taxi queue. The Monday morning traffic was the biggest hold up, but I was home by about 07:30, ending another trip that was mostly business, but included a good deal of sightseeing and other fun. This entry was posted on Monday, 22 August, 2016 at 20:20	and is filed under Diary. You can follow any responses to this entry through the RSS 2.0 feed. You can skip to the end and leave a response. Pinging is currently not allowed.